China will further encourage imports of products and services involving key technologies that meet the country's demand for higher-level consumption and push the upgrading of its domestic industries, Premier Li Keqiang said. Li made the remark as he inspected the Ministry of Commerce and the General Administration of Customs on Monday and chaired a meeting on promoting more opening-up. 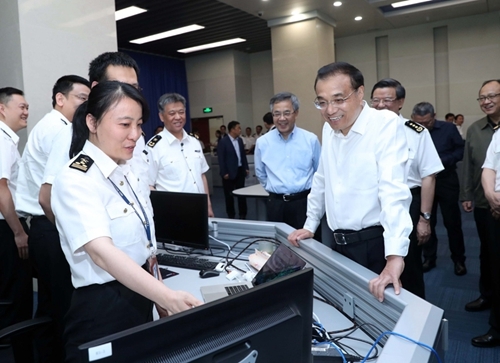 Modern information technology should be further applied to improve customs services, Li said, and it is important to further cut the time and cost required for customs clearance of imports and exports. He also said the administration should resolutely crack down on smuggling, and firmly prevent the importation of overseas garbage and products of inferior quality to better protect the rights of consumers and producers. China will open its doors even wider and should work positively to improve the business environment for foreign investors, the premier stressed. He pointed out that the opening-up experience accumulated by pilot free trade zones should be expanded across the country, making China an attractive place for foreign investors. Noting that the Ministry of Commerce and the General Administration of Customs had made tremendous achievements in pushing forward opening-up, Li stressed that the strategy has advanced China's reforms in the past 40 years. It is an inevitable strategy for China in the new era, adding that it will help deepen reform, boost market vitality, improve the environment for development and promote high-quality growth. He said that it is necessary to encourage enterprises to compete in the global market and boost innovation to improve the quality and brand influence of exported products. That will nurture new growth drivers in foreign trade and expand market diversity, he said. China will accelerate updates to the negative list for foreign investment, widen market access and strengthen protection of intellectual property rights, Li said. It is important to firmly safeguard the multilateral trade system and work with more countries to jointly improve trade liberalization and trade facilitation. This will effectively prevent and deal with risks and realize win-win development through opening-up and healthy competition, Li said. According to the General Administration of Customs, China's foreign trade volume rose 14.2 percent year-on-year to 27.79 trillion yuan ($4.28 trillion) in 2017, ending the decline of the two previous years.